First of all, vocal atheists, such as myself, aren’t “fighting” against the gods. Yes, gods, as in plural, but I’ll get to that in my second point. We are arguing against the various fan clubs of the gods. All 50,000+ variations of fan clubs dedicated to over 4,400 imaginary gods (30million+ by some counts of Hindu gods). It’s the fan clubs that try to force their beliefs on to others. It’s the fan clubs that try to put their beliefs into science classrooms. It’s the fan clubs that try to restrict human rights. It’s the fan clubs that imprison people of other faiths or no faiths. It’s the fan clubs that hack nonbeliever’s apart with machetes. So no, we are not fighting against the gods, we are fighting against the people that claim to speak for gods & think others need to follow their beliefs. We don’t believe the gods exist, but we know their fan clubs do, just like we don’t believe Harry Potter is real, but we know the fan club dedicated to him are. You can bet that if the Harry Potter Fan clubs tried to force others to accept the laws of the Wizard world or started imprisoning Muggles, that we’d start fighting against them too. Second, Pastor Greg Locke says the fact we “fight” against his god means we have a “sneaking suspicion” his God is real. I’m guessing Pastor Locke is working under the misconception that atheists argue against Christianity more than other religions; I could be wrong, but I doubt that I am. This would explain why he would think we only suspect his god is real…why else would we argue against his god more. Pastor Locke needs to understand that his perception is skewed by his location & the very fact he’s Christian. Being Christian, & a Pastor at that, he is going to see & experience atheists arguing against Christianity more than against other religions. I mean, why would I argue against Brahma if I was talking to Pastor Locke? Furthermore, being in America, he’s going to end up talking to more American atheists, & more Western atheists in general. With America being a Christian majority country, American atheists (and Western atheists in general) are naturally going to argue against the religion that affects their lives the most or that they left & know the best. This will all lead to Pastor Locke having the misperception that atheists are only concerned with his god. It’s unsurprising that Pastor Locke doesn’t see atheists like myself arguing with Muslims or Hindus. Since I follow atheists from around the globe, I get to see atheists in India arguing against Hinduism. I get to see atheists in Israel arguing against Judaism. I see atheists in Turkey & Pakistan arguing against Islam. I see atheists from all over arguing with theists of all stripes. Pastor Locke’s logic that arguing against Yahweh somehow means that atheists suspect Yahweh is real would suggest that atheists that argue against other gods mean they must suspect that god is real. I can guarantee Pastor Locke wouldn’t agree with that, so by extension, he should accept arguing against his god doesn’t mean there’s a suspicion his god is real. To not accept that would require a Special Pleading fallacy. Third, he challenges us to go outside & ask god to reveal himself to us. Well, news flash Pastor Locke, millions of us have done that, some many, many times. For myself, I asked Jesus to be my savior as a young child and a couple times in my teen years too. As an adult, in fact just this year, I begged God, with tears in my eyes, to show me that my mom had actually gone to heaven as she believed she would. I got nothing as a child, teen or adult. He answered you and you missed it or chose to ignore it. How do I know this? Because these are the only answers Christians ever have to it. They are the unfalsifiable cop-outs used to avoid admitting their god may not be real. Answer #1 is obviously not a sound refutation since it requires the ability to read minds. To be honest, my gut reaction to this answer is to simply say, “Screw you, you insensitive jackass.” To tell me I wasn’t sincere is to tell me that my tears and my grief weren’t real. It is to tell me that I wasn’t sincere in my pleas to know if my mother was safe and happy. So please Pastor Locke, I challenge you to look me in the eyes & tell me I wasn’t sincere. As for answer #2, if God answered my pleas to know if my mom was safe, why would I choose to ignore it? Why bother asking in the first place to just ignore the answer? That should make no sense to anyone with a shred of empathy. What if he answered me and I just missed it? This version of answer # 2 implies God is too incompetent to communicate in a manner that I couldn’t miss or ignore. I doubt Pastor Locke would agree his God is incompetent, so we can safely say answer # 2 is not a sound refutation either. Where does this leave Pastor Locke then? If he, or anyone else, has an answer that isn’t covered by #1 or 2, I’d love to hear it in the comments below. The simple fact is, there are millions of atheists that are former Christians or that have tried to call on the Christian God & they all got nothing. Millions of them. The idea that not a single one of them was sincere enough or that every one of them ignored or missed god’s answer is patently dishonest on the part of apologists. The Problem of Divine Hiddenness soundly refutes the core Christian doctrine that god desires a relationship with all of us. The fact millions of us have tried to call on God & got nothing in return forces them to come up with fallacious cop-outs and bad logic to try & explain away this fact. “Atheism destroyed in 2 minutes…”? No, Pastor Greg Locke, you didn’t destroy atheism and I sincerely doubt you could destroy atheism if you had 2 hours to do it. It is truly more troubling to find a weak, untenable argument coming from an advocate of one’s own position than an equally weak untenable argument coming from a critic. Myopic, unsophisticated opinions cause one to wonder whose side the proponent is actually on. Have you ever watched the debate arguing the “pre-suppositional” proof of God? It’s certainly a different take on the matter and I think you would (Bruce specifically and by extension those interested in his position, whatever the disposition thereto) find it a new vista on which to entertain the thought. I’ll try to watch the debate while putting kids to sleep then get back to you. But I’m curious if you were implying my rebuttal was “equally weak & untenable”? Not at all, however; I feel certain that there are those among the atheist/ anti-theist/ agnostic world view who you wish never had access to an internet connection for the same reason. Yes, there are people that use painfully fallacious arguments or are just outright assholes. 1: A person’s sincerity is a factor Psalm 51:17 The sacrifices of God are a broken spirit: a broken and a contrite heart, O God, thou wilt not despise. 2. The ONLY thing we (humans) have to offer a supremely powerful God is the only thing He gives us agency over: our will. In fact, it is only by the gift of God that we can have the requisite conviction of sin necessary to desire to relinquish our will to Him. 3. I am still working on number 2. I don’t have all the answers, but neither do physicists, physicians, engineers, philosophers or even historians. 4. 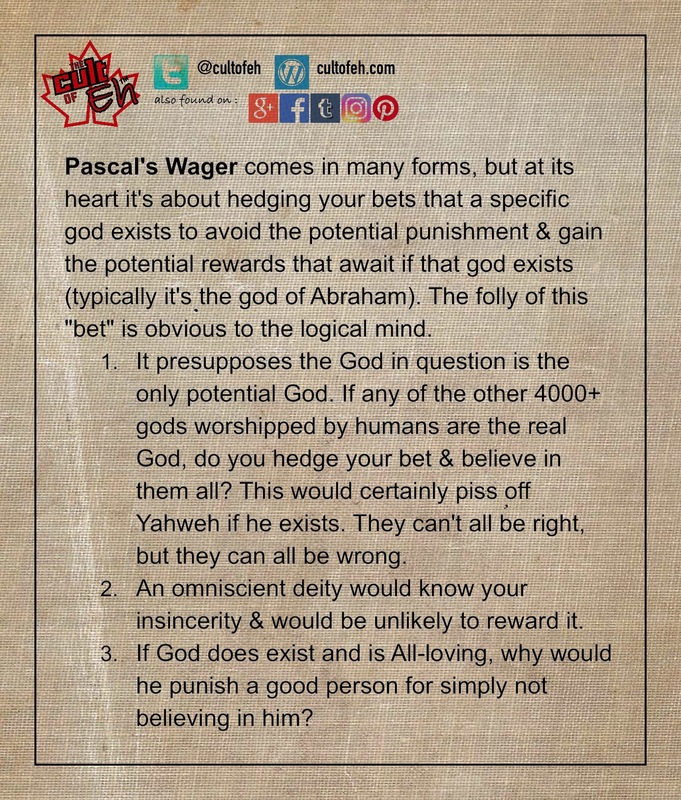 Pascal’s wager is THE ABSOLUTE WORST argument for seeking after God. That is the search for self righteousness masquerading as piety which is the hobgoblin that besets most sincere believers. 1) I can accept that sincerity could be a factor, what I can’t accept is the idea that I wasn’t sincere enough or that not one of the millions & millions of atheists was sincere enough. The measure of sincerity seems to be whether the result is a conversion. No conversion = no sincerity according to Christians I speak with. Considering it’s impossible to objectively measure someone’s sincerity, we need to go off their words & actions. Someone spending decades of their life searching for god seems pretty damn sincere to me. I get your point It is impossible for me to try to grasp why I became a believer at time (a) on thr timeline rather than earlier or later or never. Furthermore, while my faith in God has allowed Him to give me victory over many of my shortcomings I still am replete with pride, stubbornness and yet others that I have either not been receptive to or about which He has not yet begun to deal with me. We experience time in a linear fashion but you may yet be a believer who has not yet had his road to Damascus experience. My mother’s unwavering, unflinching faith when staring into the face of death had a profound effect on me that at first appeared like apathy toward me and my young daughters whom i was raising alone. I needed her input. She offended me with her calm. She never struggled with the questions that you and i do. The big whys and hows… I envy that type of faith sometimes but to deny my skeptical nature would be the most blasphemous affront to the God who made me this way. I have and do pray for you personally as well as the unbelievers who ,through pain inflicted on them by a world and people who claim to represent God, have had their fledgling faith shipwrecked. That is whom the Master is referring to as little ones when He said (paraphrasing) woe unto those who would harm these little ones. It would be better that a millstone were tied around their necks and they were cast into the sea. That is what I believe “taking God’s name in vain” is. There are plenty of “preachers and paritioners”who’d never say GD but who condemn people to hell when the Bible says that Jesus; the one who looked up at His Father in Heaven and asked for Him to forgive his executioners because they didn’t know what they were doing, that will do the judging. He alone paid the price and he isn’t the kind of judge that has special handshakes with lawyers with whom He has some heavenly “good ole’ boy” system set up. I should’ve been more thoughtful before hitting the post comment button, but if Pascal’s Wager were valid it WOULD seem that Hinduism would be numerically the safest “bet”. How could a pantheon of 20 plus million deities be jealous of ONE MORE? Haha! That’s a pretty good point on which religion to hedge your bets on. In my view it is more unfortunate when a heartfelt prayer made at a critical stage is successful. By any measure there are a number of times when an outcome will match the hopes raised in prayer but we need to see these ‘miracles’ for what they are, random outcomes frequently assisted by medical intervention and with no verifiable link to the gods. I reach this conclusion because the followers of most organised religions report occasional success with their prayers. It seems logical that either all of the gods are occasionally responding or, in my view, none of them are. Very interesting man. Keep it up.